The Writers Alley: Expect the .... what? We all have them. Personally, I "expected" to be home this week with my whole family. Instead Annabelle is still stuck in the hospital, back in the ICU no less. Sherrinda did a great post on expectations based on names earlier this week. But what other kind of expectations might readers have for your books? Imagine if you are a John Grisham reader, and pick up his next novel, open the book, and out comes a sordid pure romance. Or if you are a Nora Roberts reader and pick up her next novel, and it is a spy thriller with no romance at all. Extreme examples, I know, but you get the point. As your name becomes your brand, your readers begin to trust you to give them something. I'm not saying you can't publish in multiple genres. Many do. Good friend of mine in my local writer's group, Kaye Dacus, publishes both historical and contemporary romances. But she has established that those are what she writes, and we trust her with that. Imagine you read Mary Connelly's books and you start reading it, only to be crying from the drama in the first chapter, and at "the end" you've cried only sad tears, and none from laughter. Personally, I write funny. Others write dramatic. Still others lace their novels in page-turning suspense. And others specialize in spicing up their style and giving their readers something unique each time, and the uniqueness becomes their own style. Whatever it is, your style is something your readers come to expect and desire. Change it up with caution and care. Some authors have little trademarks they leave for their readers. Like dog lovers might make sure they have some type of dog in ever book. Or cat. Or turtle. Or chicken. Or a one-eyed science research rat. While I don't think it is quite as important of an expectation to meet (especially if the rat is your trademark...), if you set it, try to keep it! Are there any expectations that you want your readers to have when they read your books? 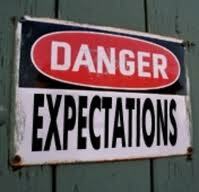 Or do you think the whole idea of "expectations" is unfair and limits your artistic creativity? I think no matter what I write, I'll always have an element of romance. Even in my first-ever manuscript, which I pegged as a women's fiction, it had "strong romantic elements". Thus why I just bucked up and admitted I write romance, LOL. I'm praying through a lot of this currently. I don't want to race to publication. I want to sure I make it there in the genre I feel most led to write. Thanks for helping me continue w/ my thoughts. Not sure I know what expectations will be for me, other than hope at the end - and maybe that isn't narrow enough - or specific enough. Great to start thinking of, though! Thanks, Krista - and praying for your girl. Unfair or not, expectations are reality, both in my writing life and my "real" life. I battle my own expectations for myself (vaulting ambitions, as Shakespeare says), as well as others' perceived expectations. And then there are those folks who tell me flat out what they want--expect--from me. And I often fall short. This is when I have to ask: Where is my focus? On me? My expectations? Others expectations? Or can I hang on to who I am in God's eyes and want he wants from me? I do think that expectations are unfair, but writers should anticipate that that is just the way readers are. I am still searching for the right fit. Like Wendy, I am not in a huge hurry for publication, so it gives me time to find the genre/era for me.